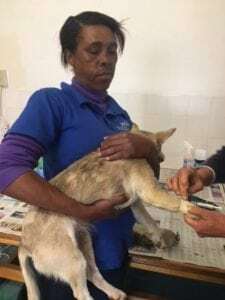 Ladismith and Zoar are two of more than half a dozen towns serviced by the Karoo Animal Protection Society, KAPS. 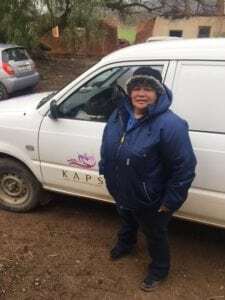 We have worked with KAPS for 10 years and are in awe of their dedication and dogged determination, in spite of the long distances they must travel to service the welfare needs of animals in this huge swathe of the Little Karoo. 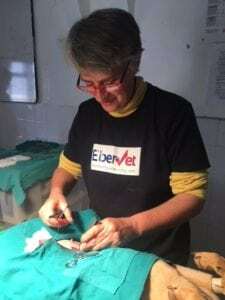 Lead by founder Colette Teale, the KAPS team includes Elize Makrige, who has been with KAPS for 18 years and is a qualified Animal Welfare Assistant; Elisma de Klerk who assists with nursing duties and setting up at mass sterilisation clinics, and Jannie Maasdorp who travels with Elize to inspect pets’ homes, rescue abused animals and transport pets to sterilisation clinics. 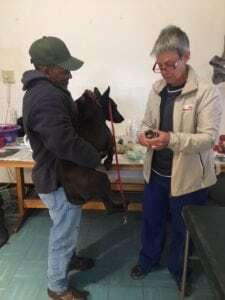 This month we sterilised more than 70 animals for KAPS, with the help of Dr Garth Ryder of De Rust, using a house on a dairy farm in Amalienstein and a community hall in Ladismith as venues for our clinics. 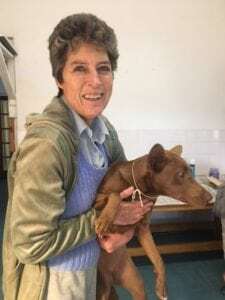 The facilities are rudimentary and it was very cold but the warmth of the hearts of the animal welfare volunteers certainly warmed the cold rooms.